Nearly a third of the world’s urban population lives in slums devoid of basic sanitation and utilities, in addition to insecure tenure, poor housing quality and overcrowding, which combine to result in poorer health outcomes of slum residents in comparison to other urban populations. Eradicating the poor health conditions in these settlements requires innovative research on health, planning and governance. We are engaged in research at all levels along this spectrum from tenure rights and community involvement, to the social clustering of disease in these areas. Slum Health: From the Cell to the Street. J. Corburn & L. Riley (eds). University California Press, 2016. Factors Associated with Group A Streptococcus Emm Type Diversification in a Large Urban Setting in Brazil: a Cross-sectional Study (2010) Tartof, S., J. Reis, A. Andrade, R. Ramos, M. Reis and L. Riley. BMC Infectious Diseases, 10 (2010), 327. Slum Health: Diseases of Neglected Populations (2007) Riley, L., A. Ko, A. Unger, M. Reis (2007)BMC International Health and Human Rights, 7:2. 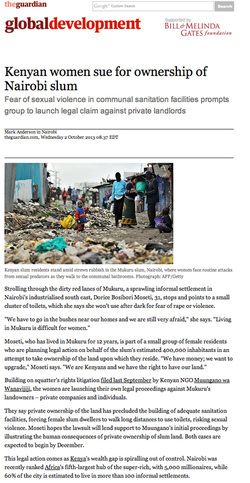 One of our projects, in partnership with NGOs and University of Nairobi, is aiming to document the health impacts of inadequate sanitation on women slum dwellers and force the Government of Kenya and private land owners to provide safe and dignified toilets and sanitation in the informal settlements. One of our graduate students wrote this article on the pending law suit to implement the 'right to sanitation' in Kenya.